As we sit here in London with the rain tipping down around us, we felt like we needed cheering up. The grey skies above don’t bring us any joy, not on this Sunday afternoon. We scour our inbox for droplets of fun, and we find just what we need to raise a smile! 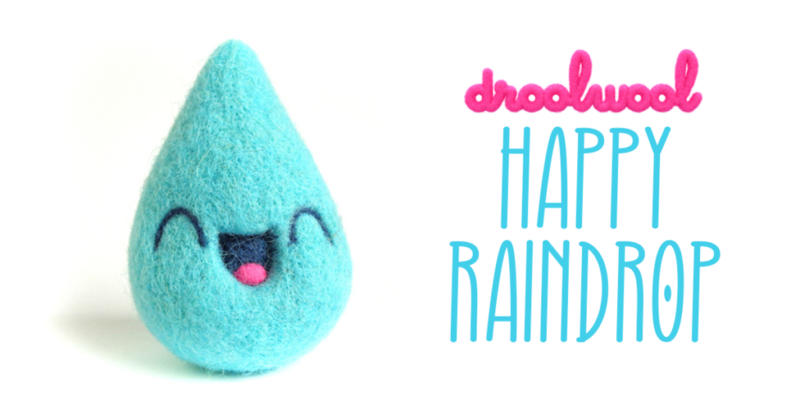 Happy Raindrop by Droolwool! Raindrops don’t like being alone…that’s why when you see them in rainy days, they’re always surrounded by millions of other raindrops. And that’s the secret of their happy faces! Whilst Happy Raindrop has sold out for now, this was only a one-of-one release. Priced at 60euro (£52), there is the potential that Droolwool will make more Happy Raindrops in the future. Happy Raindrop was originally part of the “Cloud and Raindrops are BFF’s” pictured above by Droolwool. Just look how happy they all look! Droolwool has plenty of felt-y goodness available on their online store if you’re looking for something to melt your heart. You can check it out HERE. You can also find Droolwool on Instagram HERE.